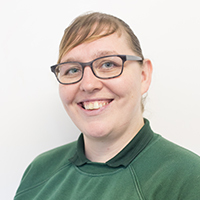 I graduated from Bishop Burton College in June 2006, with a foundation degree in Animal Management and Behaviour, and a Honours degree in Animal science. I have been working at Vermuyden Vets since November 2007. My main interest is working with small animals. My own pets include a 2 year old Siberian husky called Abi and 2 Hermann's tortoises.